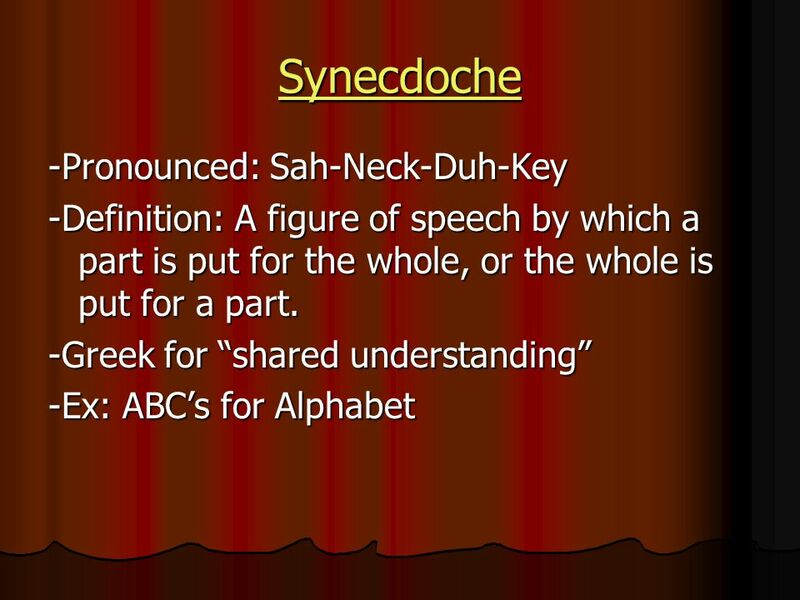 4 The Difference Synecdoche is more specific. Metonymy is more general. 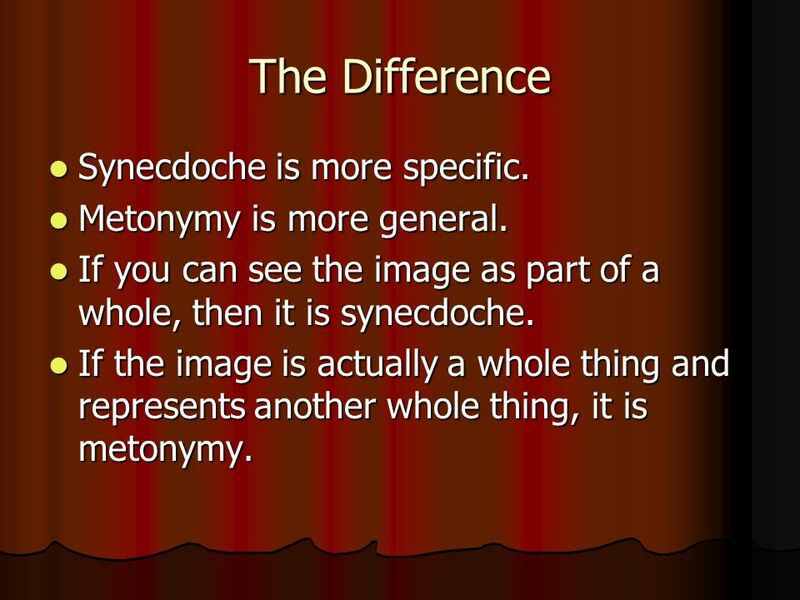 If you can see the image as part of a whole, then it is synecdoche. If the image is actually a whole thing and represents another whole thing, it is metonymy. 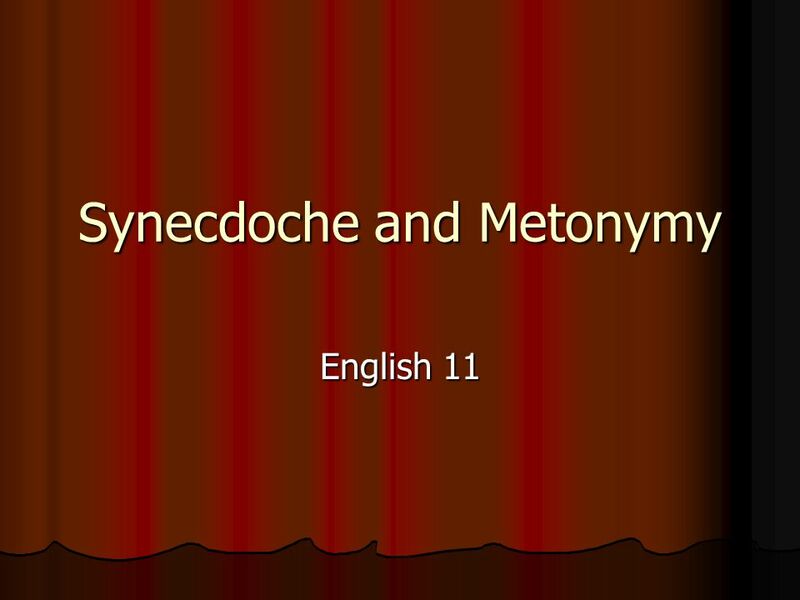 Download ppt "Synecdoche and Metonymy"
Is life so dear or peace so sweet as to be purchased at the price of chains and slavery? --Patrick Henry The repeated p and s at the beginning of words. Agenda 1. ISU Silent Reading 2. Complete Figurative Language Handout 3. Symbolism Note 4. Read “The Scarlet Ibis” 5. Complete “The Scarlet Ibis” Handout. Metonymy Niyatt Mengis Period 6. 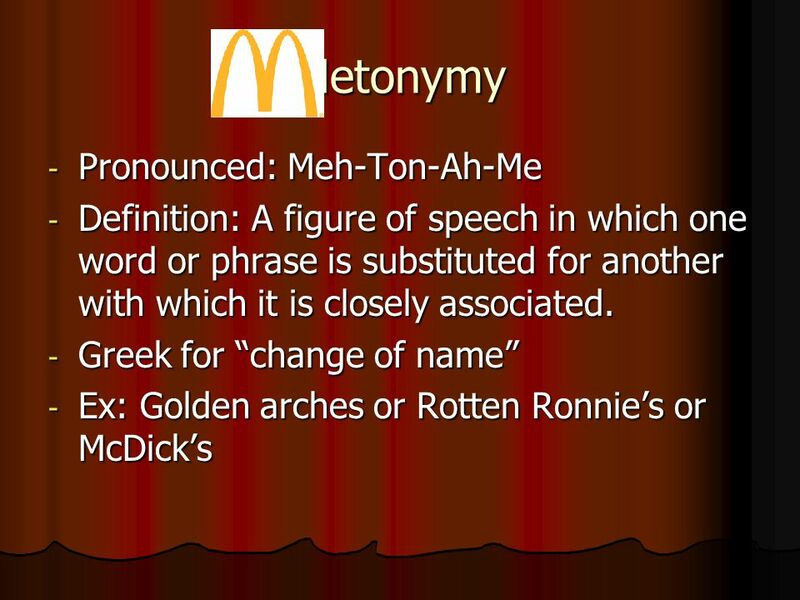 Definition Me·ton·y·my [mi-ton-uh-mee] Noun - Rhetoric A Greek term meaning “a change of name” A figure of speech that. SCANSION This is simply the term to describe the ANALYSIS of poems. 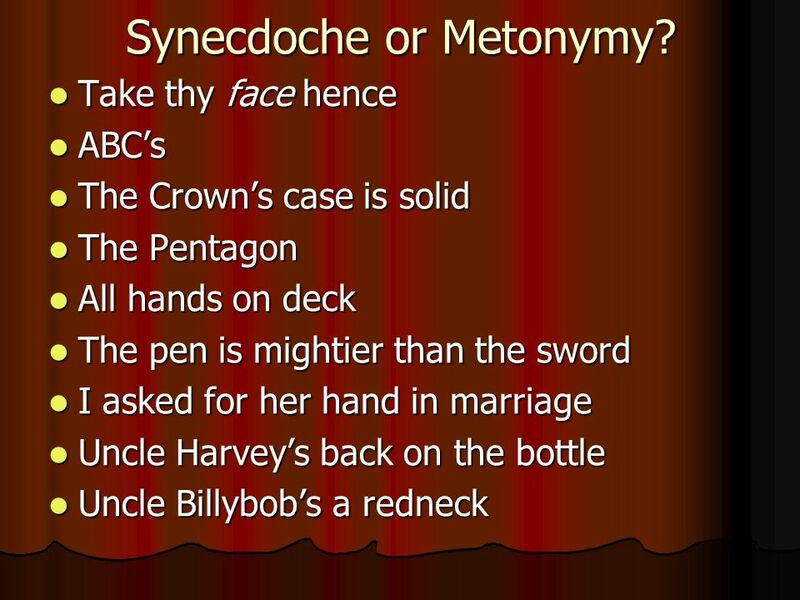 In a scansion, you might analyze and make note of: the metrical pattern the type of. Unit 2 The Olympic Games. Do you know any stories in ancient Greece ? Metaphor and Metonymy. A conversation: Your friend comes in out of the rain. n “Well, you’re a pretty sight! Got slightly wet, didn’t you?” n “Wet, I’m. PERSONIFICATION AND IRONY BY ALEX WINTER, BLED ALIU, MATTHEW TATUM. 1. Put quotation marks around anything someone ACTUALLY SAYS. Ex. "Stop!" screamed Bob. Not "Bob told people to stop.” "Why should I stop?" asked Suzy. Literary Tools. plot diagram Paradox  Definition: a statement whose two parts seem contradictory yet make sense with more thought.  "They have ears. Literary Terms English 11 AP. The Foil A foil is a minor character who prevents the main character from carrying out plans and/or succeeding. A foil is. What are we up to today? Learn about ways of responding to imagery in a text. Learn about the ways metaphor creates an effect on the reader Learn how. How can we represent three-dimensional figures in only two dimensions?